The text of this NKJV Bible is arranged in 365 portions, each including devotional insights derived from 'Dr. Stanley's Life Principles Bible'. The full text of the Bible is broken into daily readings so you can read the Bible in a year. The daily 15 minute readings consist of a passage from the Old Testament, readings from Psalms and Proverbs, and a New Testament passage. Notes from Dr. Stanley shed additional light on each day's readings, and articles apply the scriptures to our daily lives. This daily Bible is designed to bring more focus and depth to the time spent in God's Word. Plus, it is the first Forest Stewardship Council (FSC) certified Bible, so it's environmentally friendly. 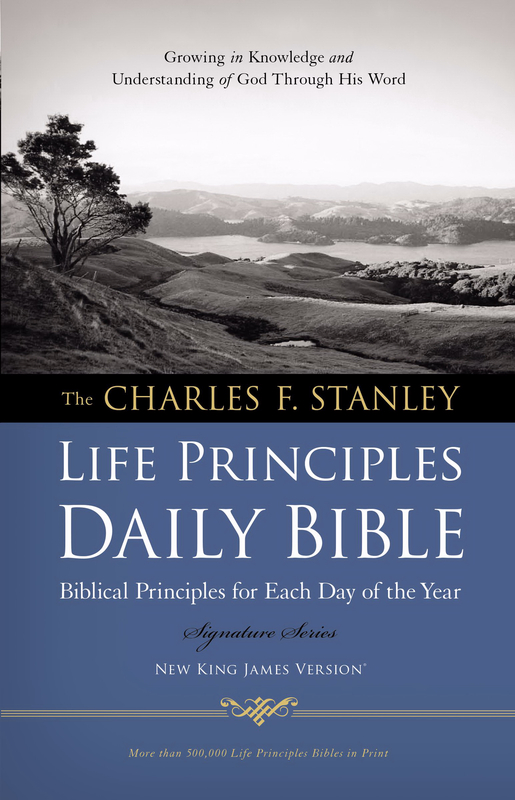 NKJV Charles F. Stanley Life Principles Daily Bible: Hardback by Charles F. Stanley was published by Thomas Nelson in October 2011 and is our 9608th best seller. The ISBN for NKJV Charles F. Stanley Life Principles Daily Bible: Hardback is 9781418548995. Be the first to review NKJV Charles F. Stanley Life Principles Daily Bible: Hardback! Got a question? No problem! Just click here to ask us about NKJV Charles F. Stanley Life Principles Daily Bible: Hardback. What is the difference between this bible and the on that cost £25.99? A:Thank you for your question. This version of the NKJV Charles F. Stanley Life Principle Bible is a 365 day devotional Bible, whereas the other version is presented as a regular Bible with notes for studying. I hope helps clear things up for you.